More reactions have continued to trail the signing of the 2018 Appropriation Bill into law by President Muhammadu Buhari. 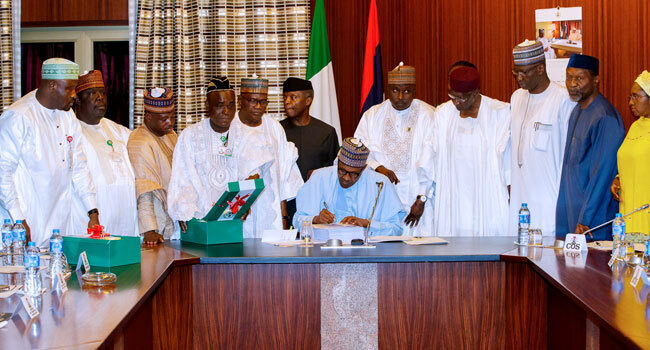 Assenting to the bill on Wednesday, the President had faulted the National Assembly for reducing allocations for some projects and including thousands of projects into the budget without consultation with the Executive. But the lawmakers justified the changes made to the budget in a statement on Friday, while the Presidency made further clarifications on the “distorted 2018 budget” hours later. Special Adviser to the President on Media and Publicity, Mr Femi Adesina, insisted in a statement that the Executive, through the Ministry of Budget and National Planning, was in touch with the National Assembly throughout the budget consideration process. According to him, the Executive was approached by the National Assembly who indicated that they intended to increase the benchmark price by $5 – from $45 to $50. Adesina revealed that the National Assembly informed the Executive that they intended to utilise $2 out of the $5 increase – amounting to about N170 billion – for projects selected by themselves. He added that the lawmakers asked the Executive to suggest important projects that could be accommodated with the funds arising from the balance of $3. The presidential aide noted that after some consideration, the Executive was of the view that an increase in the benchmark price of crude oil to $50 was not unrealistic. He explained that this prompted the President to accept the proposal in the spirit of compromise required for a successful budget exercise. “The Executive, therefore, restricted itself to submitting, for the consideration of the National Assembly, important items that could be funded from $1.75 of the $3 increase. NASS eventually raised the benchmark price to $51, apparently to accommodate the additional allocations to Health and NDDC. “The Executive is, therefore, surprised that with an additional sum of N170 billion available for the National Assembly to spend on Constituency Projects, together with the sum of N100 billion, already provided for in the budget, that the National Assembly should feel it necessary to cut allocations to important national projects, and thereby distort the budget, in order to further increase their allocation for Constituency projects. How much is enough!” it added. Adesina maintained that the President’s position was clear while delivering his speech when stated his concern about some of the changes made by the lawmakers. Stressing his point, he quoted the President as saying, “About 70 new road projects have been inserted into the budget of the Federal Ministry of Power, Works and Housing. “In doing so, the National Assembly applied some of the additional funds expected from the upward review of the oil price benchmark to the Ministry’s vote. Regrettably, however, in order to make provision for some of the new roads, the amounts allocated to some strategic major roads have been cut by the National Assembly”.